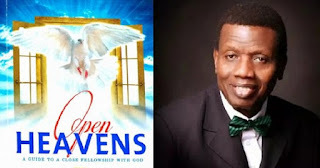 Open Heaven [27 May 2018] Grace I - Open Heavens Daily Devotional Messages, By Pastor E.A Adeboye. Grace is commonly used in the Bible to describe the demonstration of God’s goodwill towards mankind, embodied in the person of our Lord Jesus Christ, and the effects of that goodwill on human lives. Throughout the Bible, God showed Himself gracious in His dealings with mankind. In the Old Testament, the grace of God is spoken of in relation to three overlapping terms, which are goodness, love and mercy. Each time the word ‘grace’ is used in the Bible, it connotes God’s goodness, love and mercy towards humanity. I pray that God will be gracious to you, and that you will continue to enjoy His grace throughout your life in Jesus’ Name. Although the application of God’s grace can be selective like in Noah’s case, it is available to all the works of God. Everything that God created, both living and non-living things, enjoy God’s grace. God upholds those who are falling and lifts up those who are bowed down by His grace. Hope opens His hands to supply all creatures their food and sustenance, thereby satisfying the desire of every living thing. God by His love and mercy provides for plants and animals alike, ensuring that whatever they need is made available within their reach. God, by His grace, has counted us worthy to be chosen from amongst the people of the world as His own special people, redeemed by the precious Blood of His Son, thereby making us His own special possession (1st Peter 2:9). Obviously, God has not treated us according to what our evil deeds deserve. Our continued existence testifies to His redeeming grace, and this same grace provides the basis for our status as children of the Most High God. Let somebody shout Halleluiah! Father, please do not let Your grace go to waste in my life in Jesus’ Name.